Nerien, an Altmer sorcerer, is a member of the Psijic Order who appears in a vision during your investigation of the ancient ruin of Saarthal. 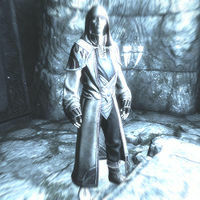 He wears a full set of Psiijic robes all the time, including the hood, boots, and gloves. As part of your initiation into the College of Winterhold, Tolfdir invites you along on an expedition to the Saarthal Excavation site. After you have used the Saarthal Amulet to unveil a previously unexplored part of the ruin, your vision gets blurry and Nerien appears with a bit of fair warning about things to come: "Hold, mage, and listen well... Know that you have set in motion a chain of events that cannot be stopped. Judgment has not been passed, as you had no way of knowing. Judgment will be passed on your actions to come, and how you deal with the dangers ahead of you. This warning is passed to you because the Psijic Order believes in you. You, mage, and you alone, have the potential to prevent disaster. Take great care, and know that the Order is watching." Nerien will appear in another vision in the quest Revealing the Unseen if you leave Mzulft by its shortcut exit. In it, he will comment on your achievements as well as warn and motivate you: "You have done well thus far, but trying times are ahead. It is imperative that you return to your college at once. You will be called on to take swift action. Rise to the challenge, and discover what you are capable of. You are on the right path, and you will prevail." This page was last modified on 20 March 2013, at 05:03.